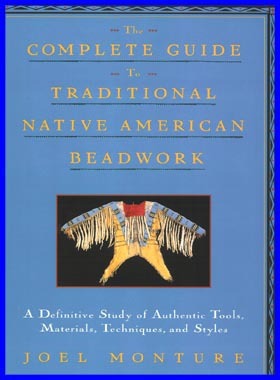 "I can think of no recent book about traditional crafts which has delighted me more than Joel Monture's Complete Guide to Traditional Native American Beadwork. All too often, books of this nature are either as boring as a repair manual, or obscure and inaccurate. Monture's triumph is that his book is not only the best and most complete book about virtually every aspect of Native American beadwork tools, materials, styles and methods, it is also clear, interesting reading. "Written from the point of view of a Native master craftsman who is also a gifted teacher, and accompanied by striking full-color photos, it can serve as either a beginning point or a lifelong reference tool. I am confident that Monture's book will bring him wide praise, not only from beadworkers, but also from any person who delights in knowing more about the meaning and the history of an indigenous artform which is finally attracting the sort of critical attention and informed appreciation it deserves." �Joseph Bruchac, author of Keepers of the Earth. Includes all the basic stitches and designs. Contains a special section on natural tanning methods. Extensive glossary. Full-color photos of authentic Native American beadwork.